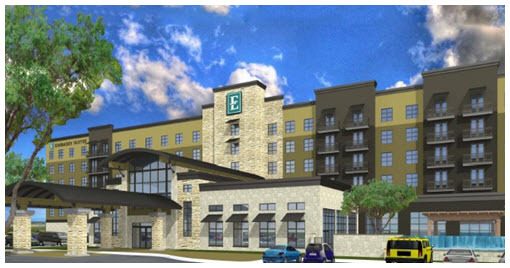 ​​​SAN ANTONIO- Embassy Suites hotel celebrated a topping-off ceremony for their development nearing completion on the former Air Force base site. The 162,000-sf project will have 156 suites and 11,000 sf of conference space. It will also house a restaurant, full-service spa and a fitness center. Construction, which began in August 2015, is set to be completed in February 2017. It's a project that Brooks City Base President and CEO Leo Gomez believes will open the door for more hotel development in South San Antonio. ​​Check out San Antonio Hotel Market Research​!